As far as I can remember, I've always loved yogurt. I ate plenty as a kid and I think that besides yogurt, cheese would have to be the second most popular dairy product that I consume on a daily basis. When my poor mother asked me what would you like to eat for lunch or dinner, I'd say yogurt, potatoes and cabbage and she'd sigh with frustration. Not much has changed since then, though I don't eat as many potatoes as I used to and my palette has broadened its horizons since then. Both yogurt and cheese are rich in protein and I generally consume quite a bit after my morning workouts at the gym. There is nothing better than a cup of cold plain yogurt after a gruesome TRX or circuit training workout! It is very traditional for North Indians (Snoopy loves cheese too, it's probably his favorite and only word he responds to) to consume a little bit of plain unsweetened yogurt as part of their meals, it helps with digestion and also aids in toning down the heat level of certain spicy foods. Don't get me wrong, I love a good lassi and frozen yogurt but there really is something comforting and delicious in a cup of fresh plain yogurt. Greek yogurt is different from the yogurt that is commonly eaten in India, it is of course, richer and creamier which made it easy to fall in love with. So much so that I always have one or two large tubs at home. 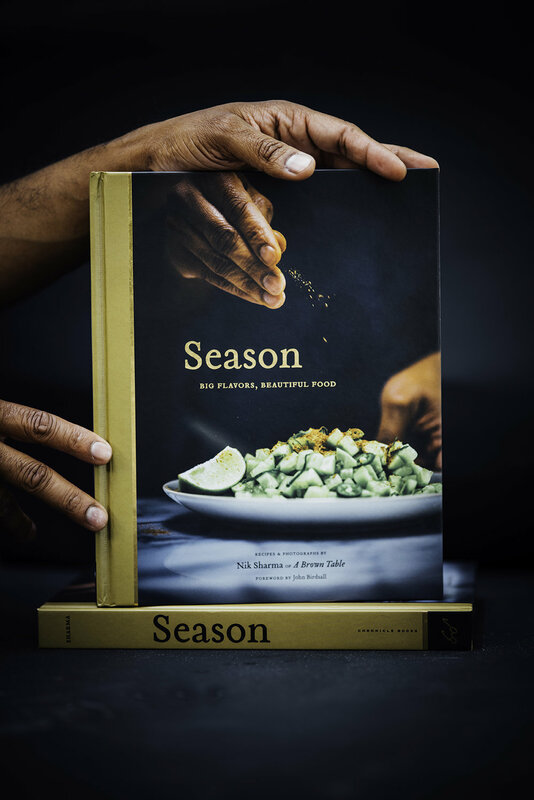 Some of you who have followed my blog for a while, are probably aware of the different ways in which yogurt sneaks its way into my recipes. The folks at Chobani's also noticed some of the recipes and were really kind to send me some of their Greek yogurt to try. Several years ago, I tried some delicious Lebanese cheese called labneh at a restaurant, I loved it so much but it was really hard or should I rather say impossible to find at any store. Thankfully as I learned from a friend, it is really simple to make and super delicious! The most sophisticated tool to make this cheese is a sieve and some cheesecloth (muslin) along with a little bit of patience while the yogurt drains its whey and transforms into a rich creamy cheesy mass. Greek yogurt is naturally creamy and rich making it a good choice to prepare labneh. When it comes to flavoring the olive oil and cheese, I threw in some fresh herbs from garden, you can try different varieties of thyme and oregano and also you dried mint and bay leaves. The olive oil gets a delicious flavor from the herbs and is excellent in salads as a dressing and even to brush slices of bread, as I did with these tartines. A little note on olive oil, it can harden in the refrigerator depending on the temperature and how refined the variety is, don't freak out, it is perfectly fine, just bring the bottle with the labneh back to room temperature. The oil will come back to its original liquid state and the cheese and oil will taste delicious! 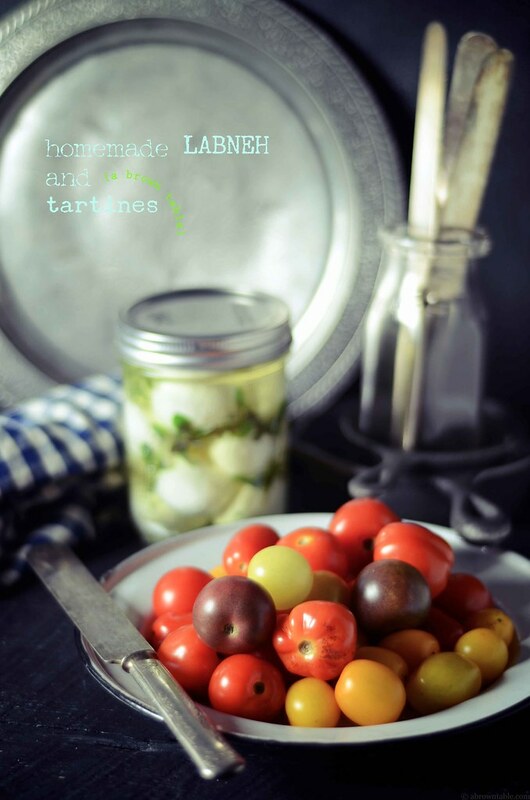 By the way how gorgeous are those pretty colored cherry tomatoes, I saw them at our local market and knew at once they'd perfect for a labneh tartine. Disclaimer: I received this product for free and all opinions are my own. 1. Mix the yogurt and salt together. Place a sieve over a large bowl and line the sieve with two layers of clean cheesecloth. Add the yogurt to the middle of the cloth and twist the corners of the cloth and tie them together with a piece of string. Place a heavy weight on top of the cloth and transfer to the refrigerator to drain for 3 days (You can drain the yogurt for one day but the longer you drain it, the creamier and richer the resulting cheese will be). 2. Discard the drained whey liquid (you can use it to make baked goods or do what I do, drink it plain, it's a great source of protein). Transfer the drained yogurt into a clean and dry bowl. Roll the yogurt into 16-18 balls and place them on a baking sheet lined with wax paper. Refrigerate the balls for another 30-45minutes till firm. 3. Once the cheese balls are firm, transfer them to a sterile clean glass jar. 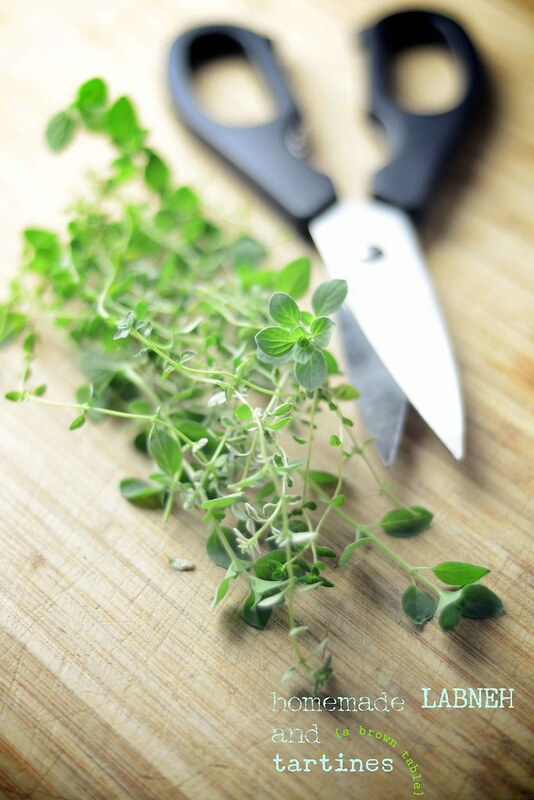 Gently bruise the fresh herbs with a knife and add them to the jar along with the peppercorns. Fill the jar with the olive oil. Seal and refrigerate for at least 24 hours before eating. Prior to serving, bring the jar and its contents to room temperature. This cheese should last for up to a month in the refrigerator. 1. Place a wire rack in the middle of the oven and preheat to 350F. Line a baking sheet tray with a sheet of parchment paper. 2. Slice the ends of the baguette with a serrated knife or bread knife. Cut the rest of the baguette into thin slices, approximately 1/4" thick. Brush each side of the bread slices with some of the olive oil in which the labneh was stored. Arrange the brushed slices of bread onto the prepared baking sheet tray and bake for 10 minutes or until golden brown on each side. Remove and transfer to a wire rack to cool for 3 minutes. 3. Spread some of the labneh cheese onto each bread slice. Thinly slice the cherry tomatoes and place on top of the cheese-smeared bread. 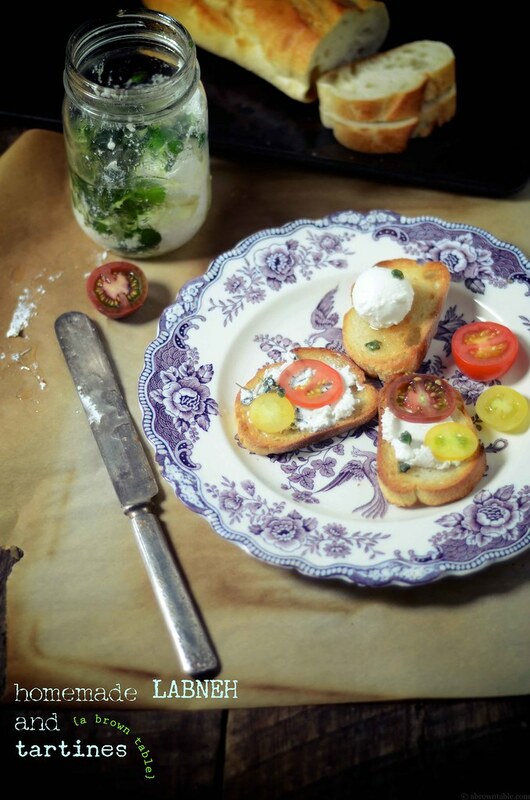 You can also garnish the tartines with the left-over herbs in the olive oil that was used to store the labneh. Serve immediately. 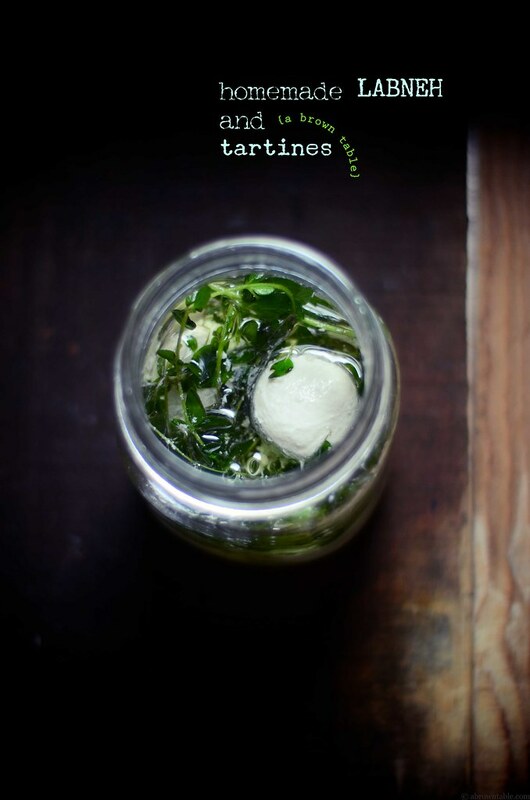 In "Cheese", "Dairy", "Labneh", "Lebanese", "Tartines"